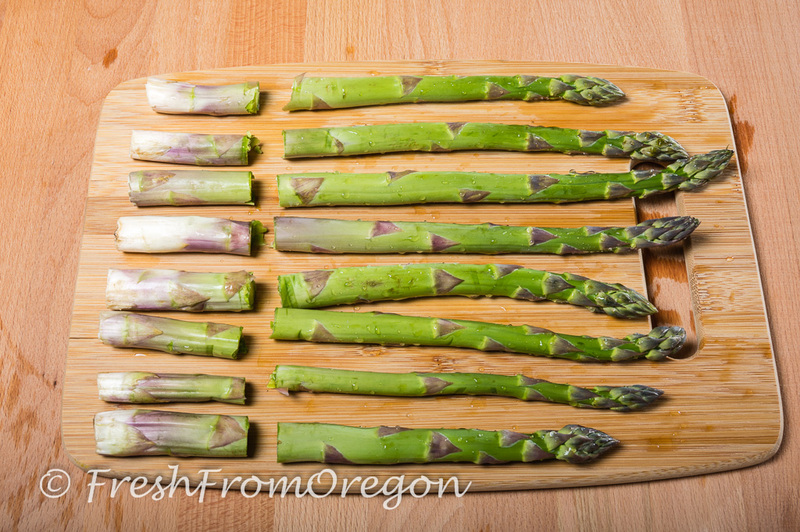 Nothing says spring like the green stalks of asparagus peeking out of the ground here in the Pacific Northwest. 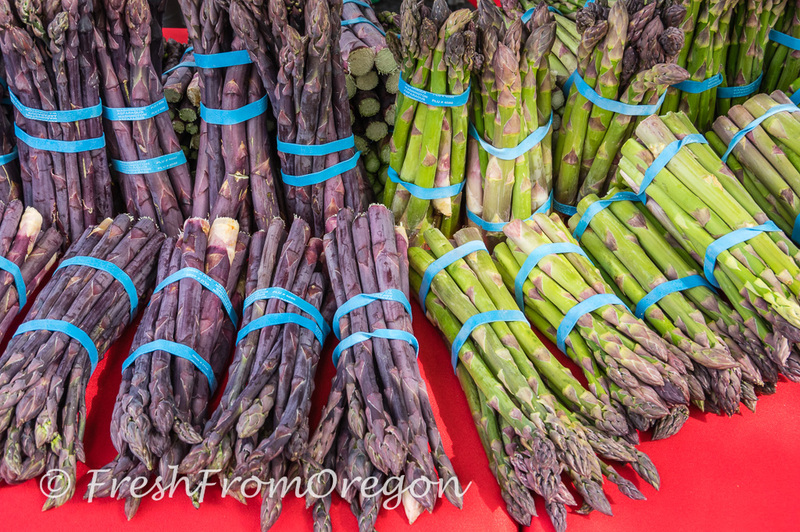 Washington asparagus is at the peak of its season. Here in Oregon you can find it at Four Seasons Markets and QFC stores. If you would like to buy directly from the source here are a few places in Washington to buy fresh picked asparagus, Washington markets. I was lucky enough to be on a trip in Washington a few weeks back in Yakima one of the many large agricultural growing areas in the state. We stopped by one of the farms to see fresh Washington asparagus popping out of the ground. There are so many ways to enjoy asparagus each day. Start off the morning with Eggs Benedict or a frittata with asparagus. For a light meal midday you can toss asparagus in a salad or a flaky tart. 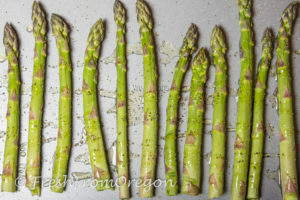 Nothing is better than some roasted asparagus as a side for a grilled piece of salmon or a juicy steak from the grill. 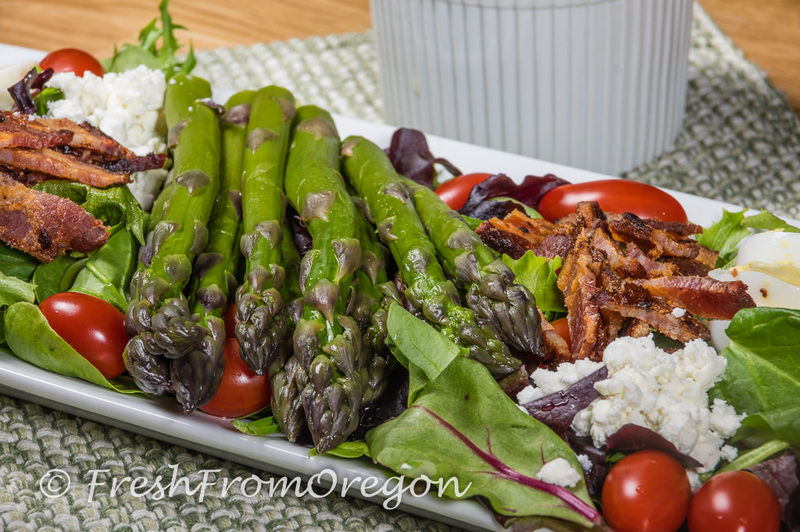 I am going to take some of my Washington State asparagus and make a hearty salad that would be good midday or perfect for a light dinner. There are two combinations you can never go wrong with, asparagus and lemon. 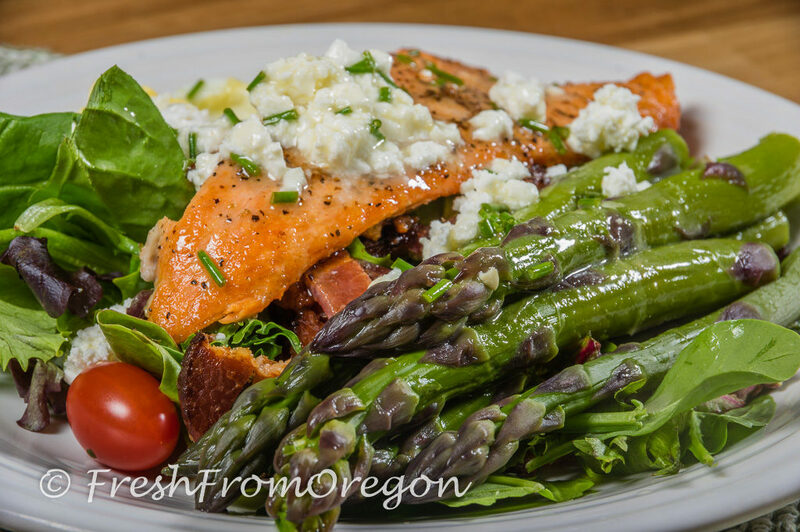 Try this fresh spring salad with Washington asparagus and add a fresh grilled piece of Pacific Northwest salmon. Bring a pot of water to a boil, add the asparagus and cook 2 to 3 minutes, until tender yet firm. Drain and run under cold water to stop it from cooking further. Set aside. Arrange the mixed greens, tomatoes, and asparagus on a plate, top with egg, bacon and cheese and drizzle with the lemon vinaigrette. Enjoy! Squeeze lemon and measure out 3 tablespoons juice. In small bowl combine lemon juice, mustard, sugar and salt. Slowly drizzle in oil, whisking constantly. 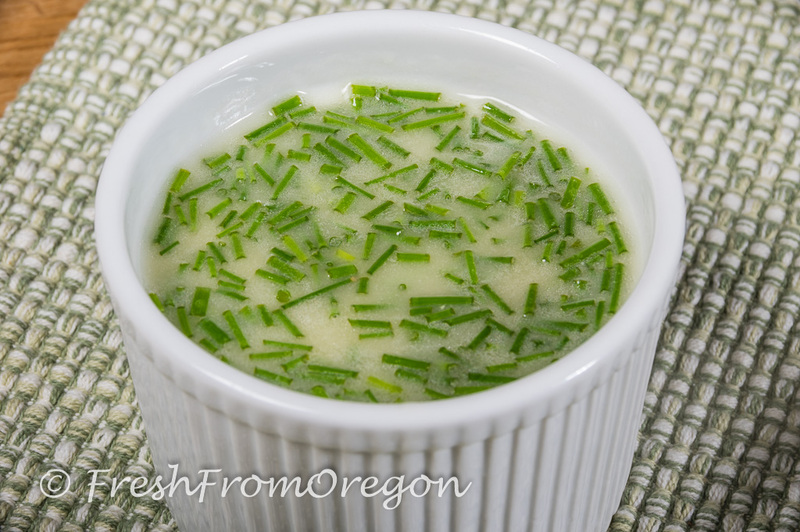 Stir in chives, cover and chill. 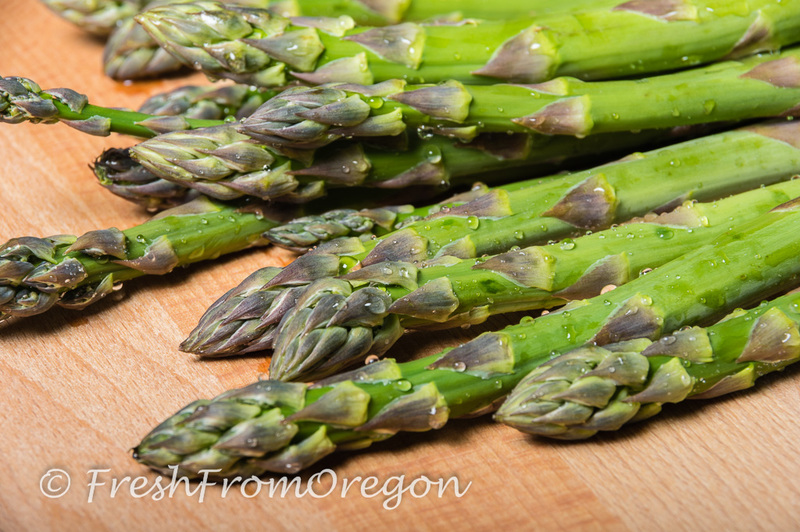 Asparagus is a member of the lily family and is related to garlic, onions, and leeks. The National Cancer Institute states that asparagus the highest tested food for glutathione, one of our most potent antioxidant defenses. 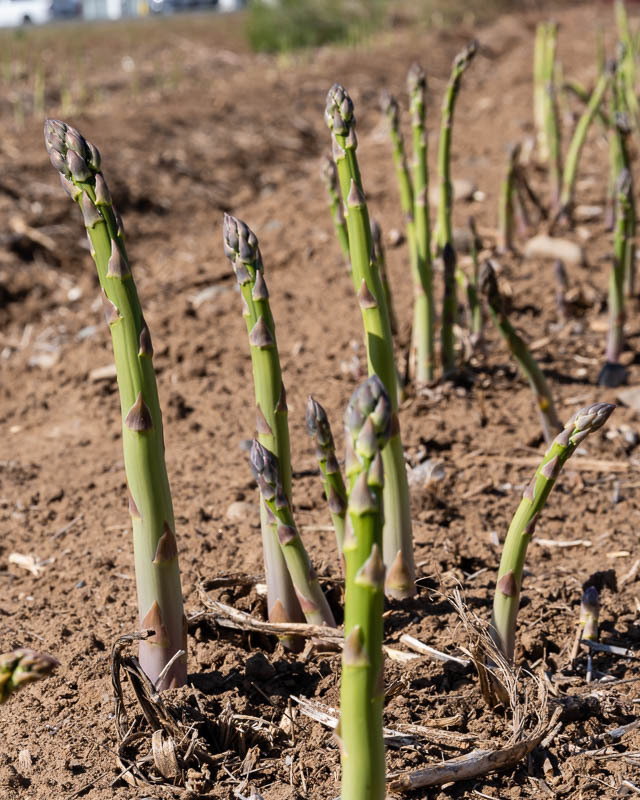 It takes nearly 3 years after asparagus has been planted to reach maturity so that it can be harvested for the full season. 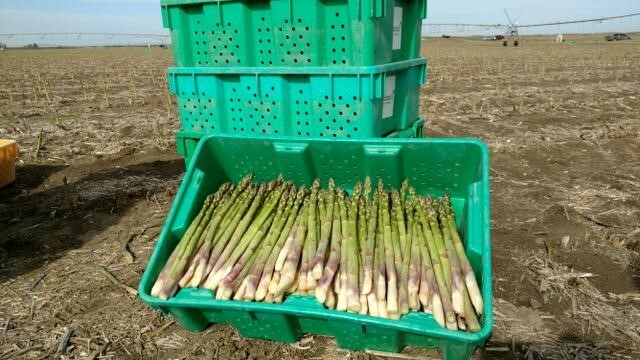 Fresh Washington asparagus coming out of the ground and ready to harvest at Imperial’s Garden fields in Wapato, Washington. A week from today I will be networking with several hundred other food bloggers. 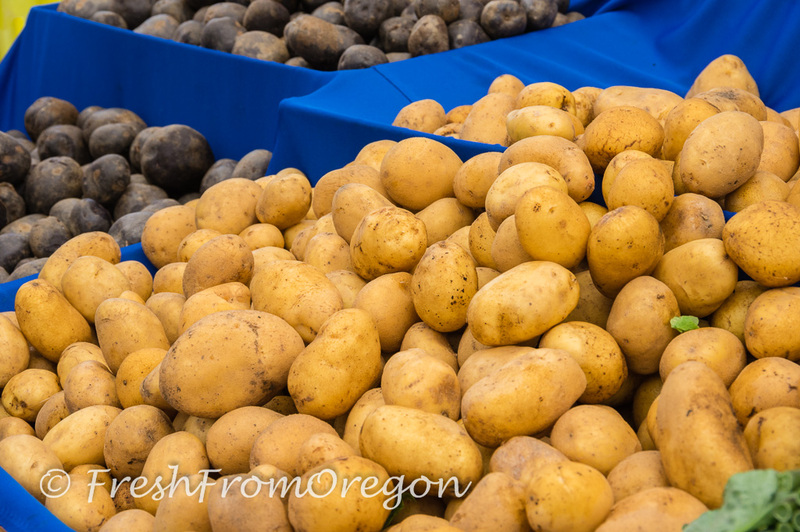 Fresh from Oregon is heading south to Sacramento, California for the International Food Bloggers Conference. John and I will be flying into the Sacramento International Airport which will be celebrating its 50th birthday on October 21st. If you are flying into Sacramento or just passing through the airport you need to check out their renovations in their food concessions. Their food concessions for the new Terminal B mirrors the Sacramento food culture and its Farm-to-Fork movement. When we head back home I plan on arriving early at the airport to enjoy a great meal before flying back to Portland. We do not have much time once we arrive and need to get a shuttle to the Marriot Residence Inn, host hotel for the conference. 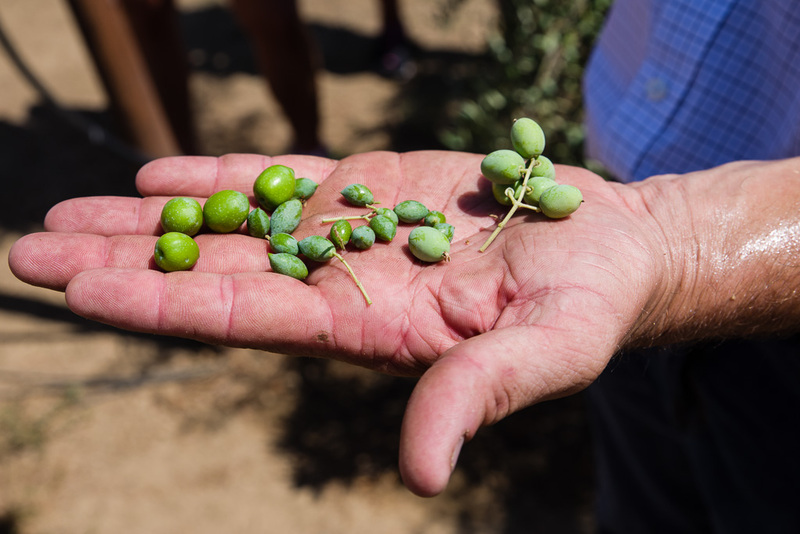 John and I will be heading on an excursion that will give us the full olive harvest experience and show us the journey from tree to table. Sponsored by Cobram Estate, the world’s most awarded olive oil, that just launched in America for the very first time last year and the Olive Oil Commission of California. Then we will have two full days of great topics, food tasting, meeting other food bloggers from across the USA and the sponsors. This will be the 5th year I have been attending the food bloggers conference and one of the most rewarding parts is meeting the sponsors, hearing their stories and learning about their products. If you are a food blogger and new to the conference do not forget to bring plenty of business cards. You will want to give them to the sponsors at the conference and to other food bloggers. This is a perfect place to network with other food blogger so do not be afraid to ask questions. I try to sit down with different bloggers throughout the conference and see what they are blogging about and find anything new I can learn. I will come home with a lot of business cards, lots of ideas and lots of new friends. During the conference I like to get the sponsors’ business cards and make some notes and then send them a quick email thank you once I get home. 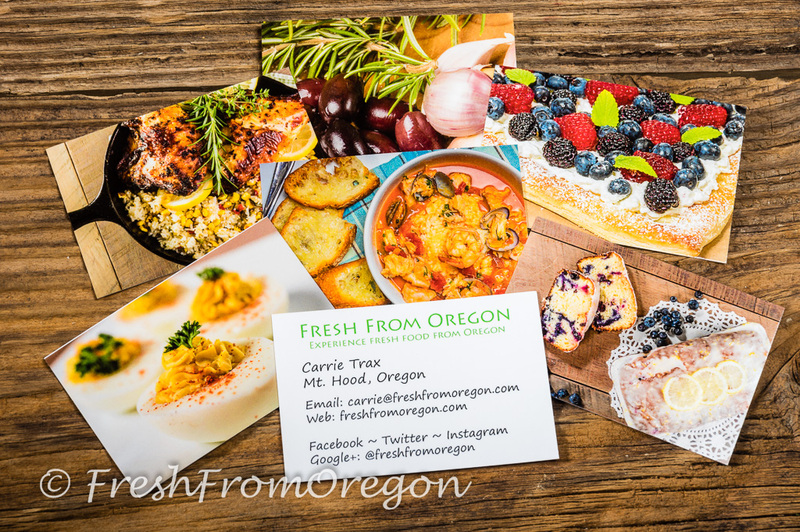 My goals this year for attending the conference is to bring my food blog Fresh from Oregon up to the next level. 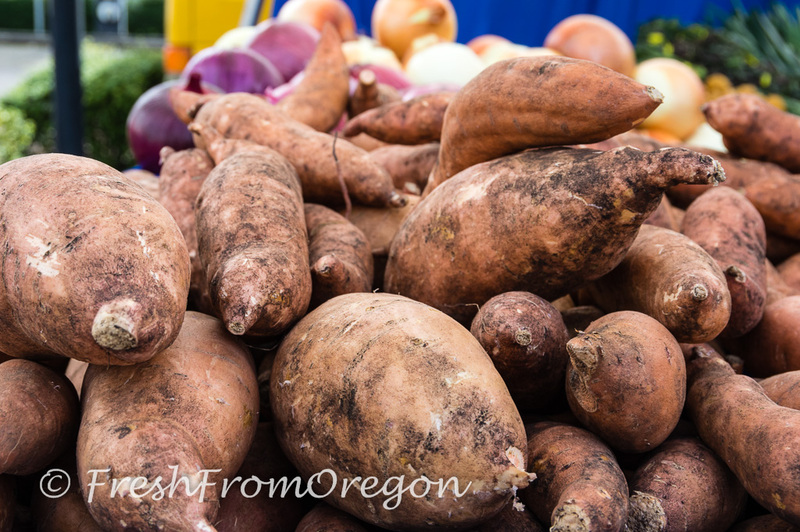 I have set three goals for my blog: Adding videos, Instagram and how to write a better blog to share my stories on what’s Fresh from Oregon. Meet the sponsors and exchange business cards. Network with other Food Bloggers, don’t be shy! Walk the city and check out local restaurants ~ check out Visit Sacramento. Bring extra room in your suitcase for gift suite items or maybe bring an extra suitcase. Review and make notes on sponsors before you come. Bring a notebook and several pens there is a lot to learn. Use your phone’s camera to take pictures during the conference and maybe some selfies with the new friends you meet! 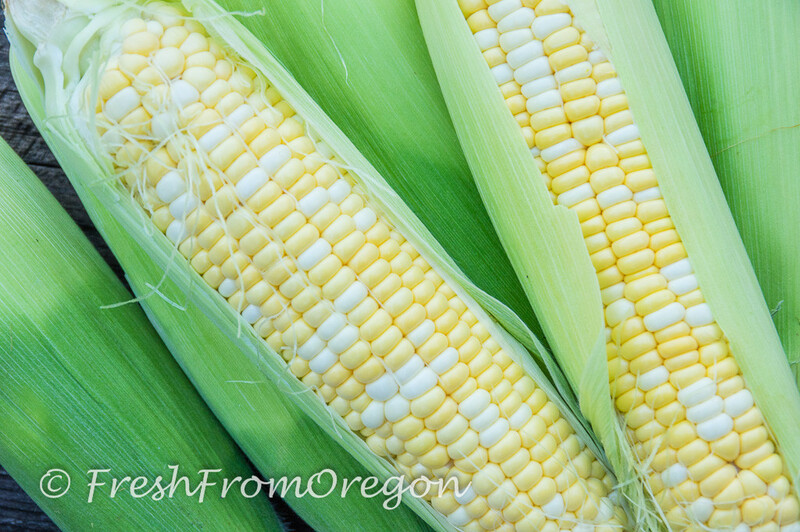 Its the peak of summer and the fresh sweet corn is just amazing here in Oregon this year. 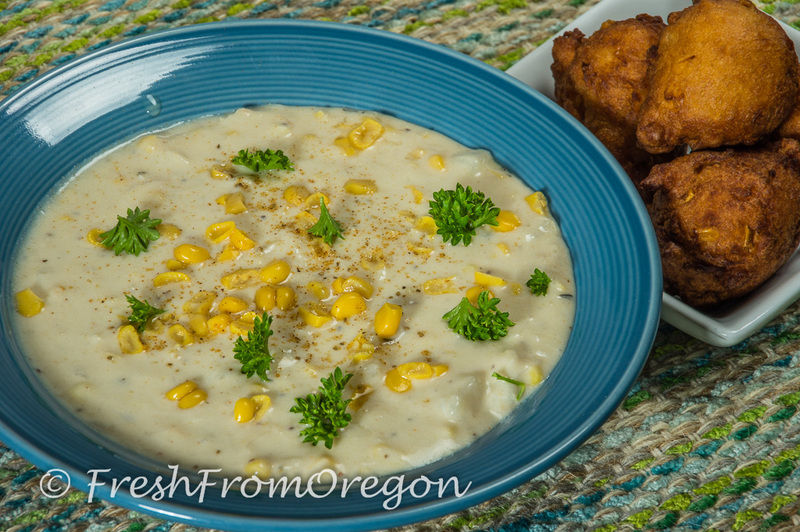 Creamy corn & crab chowder is perfect for the summer dinner table. Yellow or Bi-color I have Fresh from Oregon corn on my summer table at least twice a week. This week I am using the fresh corn to make a Summer Corn & Crab Chowder. 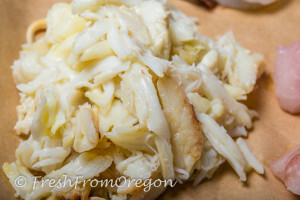 We are lucky here in Oregon to have fresh Dungeness Crab from the Pacific coast daily. 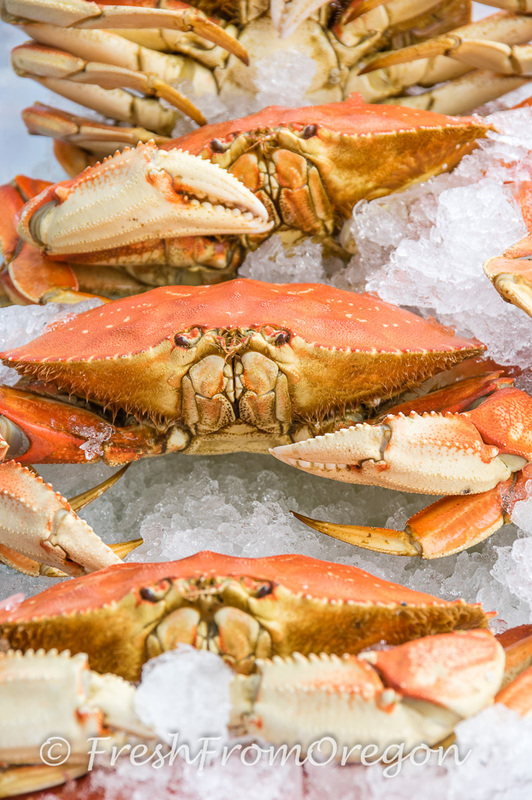 You can find fresh crab at the local farmers market, fish store or at your local supermarket’s fresh fish department. 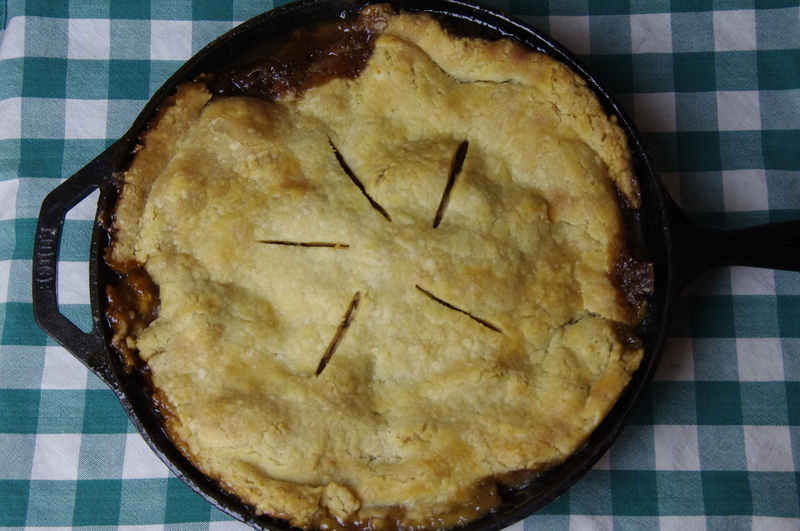 This recipe is quick and easy to make and don’t forget to pick up some fresh potatoes too. Parboil potatoes*; immediately submerge in cold water to stop cooking. Set aside or in the fridge until ready to add to chowder. Melt butter in dutch oven on stove top; add chopped onion and saute for 5 minutes or until translucent. Stir in 1/3 cup flour; slowly add 2 cups chicken broth, whisking. Slowly stir in 2 cups half and half; season with salt, pepper, crab seasoning, cayenne, thyme, and a bay leaf. Add parboiled potatoes, fresh corn and crab meat; simmer over low heat, stirring occasionally for 30-45 minutes. Add more chicken broth to thin if needed. Remove bay leaves before serving. Garnish with fresh chopped parsley and sprinkle on some paprika. 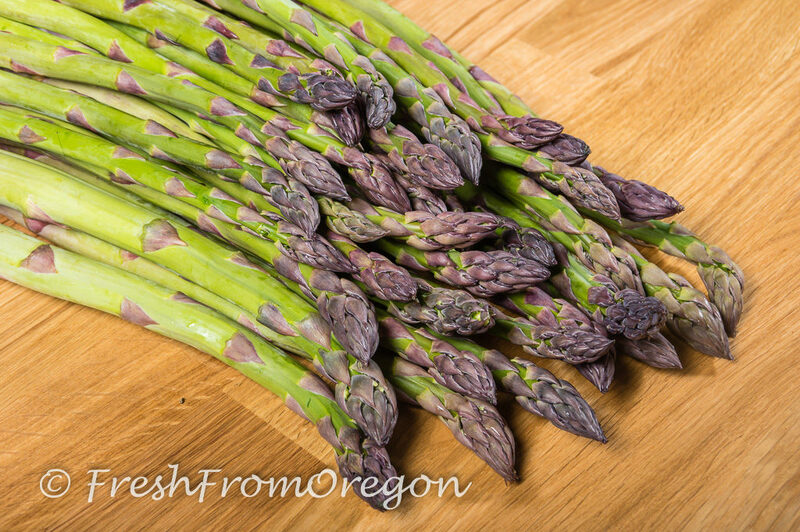 Fresh from Oregon and now in season fresh asparagus is perfect to serve at any meal. 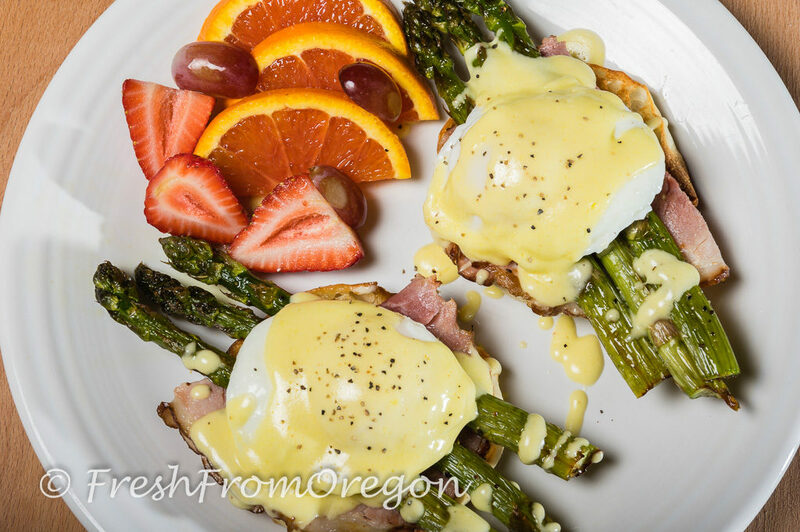 I try to make a new breakfast dish every Saturday morning and with a bunch of asparagus in my refrigerator the first thing I thought was Eggs Benedict with Hollandaise sauce. Hollandaise sauce is a mild, rich sauce made with egg yolks, lemon juice and butter. Beside the traditional topping on Eggs Benedict it is served over vegetables like asparagus and artichokes and is also great with grilled seafood. The first time I made Eggs Benedict I thought I would never master the Hollandise sauce so I decided to turn to the master Julia Childs and her recipe. It looks simple, whisk your egg yolks, lemon and some water in a saucepan for a few minutes. When it says to use low heat you use low heat and whisk non stop but it only takes about 2 minutes to thicken up the egg. Next step in the recipe it says to soften butter and that is important and to keep whisking. From start to finish it only takes about 5 minutes but you need to keep your focus on making the sauce. I do the sauce first and let it set covered and then slightly heat it up for a minute once I am ready to serve. I like to cook each item and then assemble. First roast the asparagus and set aside. Toast 4 English muffins and set aside. Next I like to make the Hollandaise sauce and once cooked set aside covered and reheat for 1 minute before I pour over the eggs. Next poach your eggs and place on a paper towel. Last, in a skillet heat the ham and brown slightly, about 3 minutes. 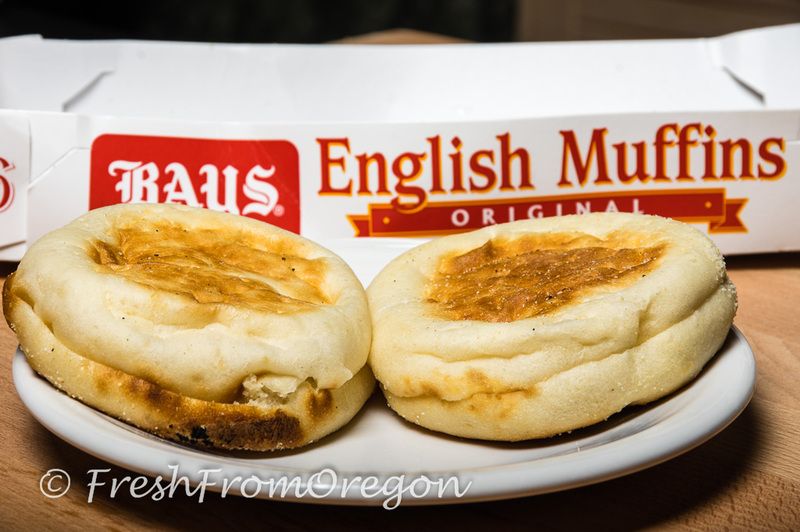 To assemble, place each half of one English muffin on plate, now add a piece of the ham. Add about three stalks of the grilled lemon asparagus and then the poached egg. Check the Hollandaise sauce and if it needs to be warmer place back on stove over low heat and whisk for about 1 minute. Pour sauce over eggs and sprinkle with some cracked black pepper. The recipes for each item are in the links below. 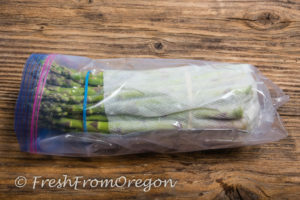 Storing extra asparagus check out some tips here! 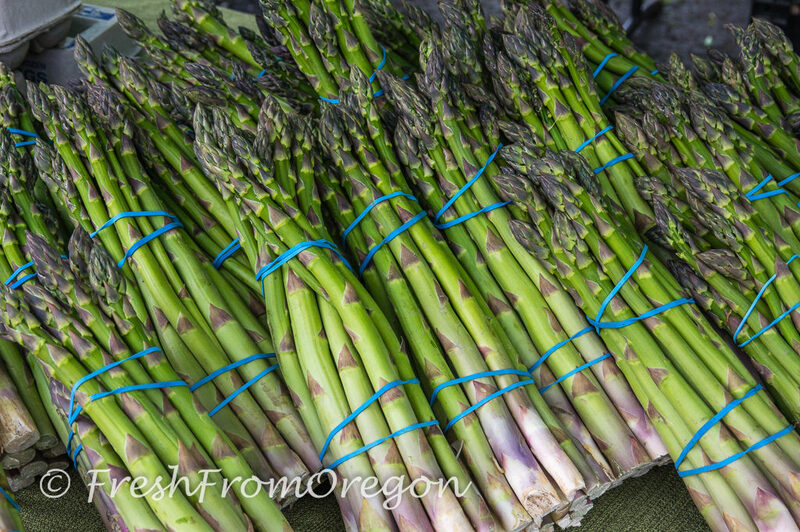 Start by buying the freshest asparagus at your local farmers market or store. Look for tightly closed tips and ends that are plump and firm. 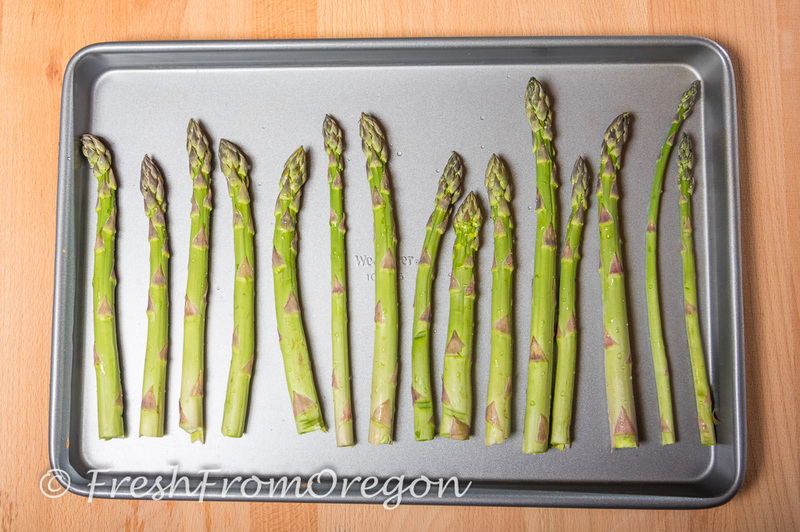 When you bring home the asparagus you need to trim about a 1/2″ from the ends of the stalk. 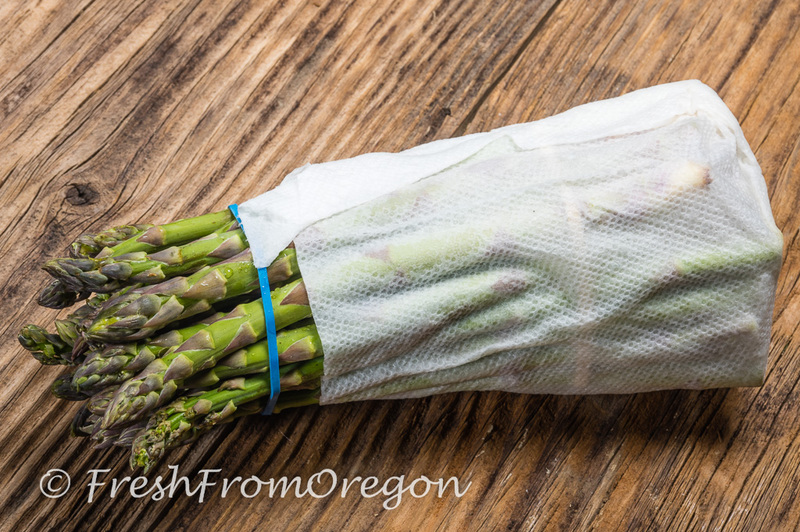 Wrap a few layers of paper towels around the asparagus stem and moisten paper towel by running under some water. Place in a plastic bag but do not seal bag. Place in refrigerator. 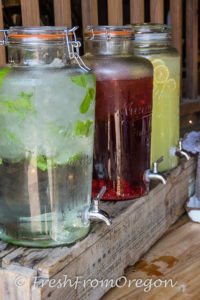 Another way to store is to fill a glass jar with a few inches of water, I use a wide mouth pint mason jar. 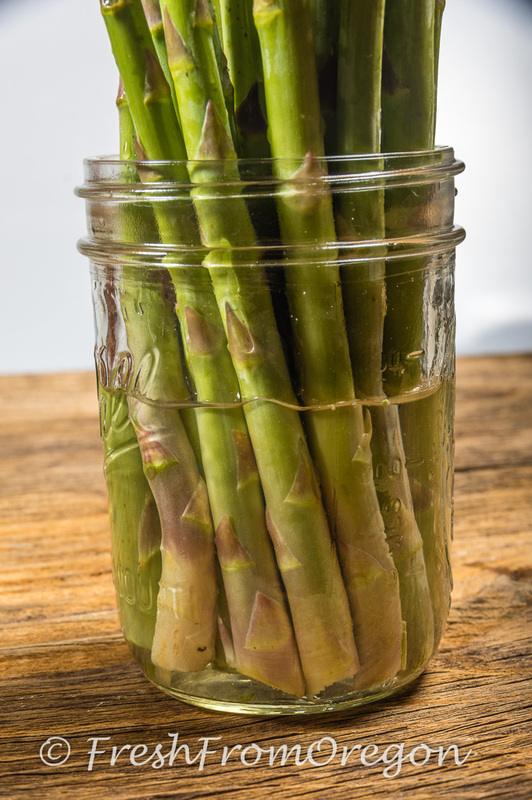 Place fresh cut asparagus in the jar making sure the ends are submerged in the water. Place in refrigerator. 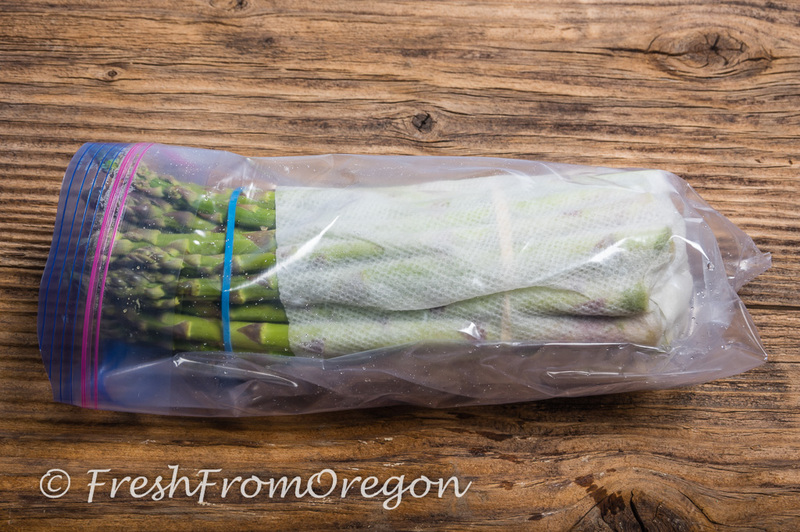 Once you get the asparagus home it needs to be stored in the refrigerator. I place mine in a plastic paper with damp paper towels wrapped around the bottom stalks. 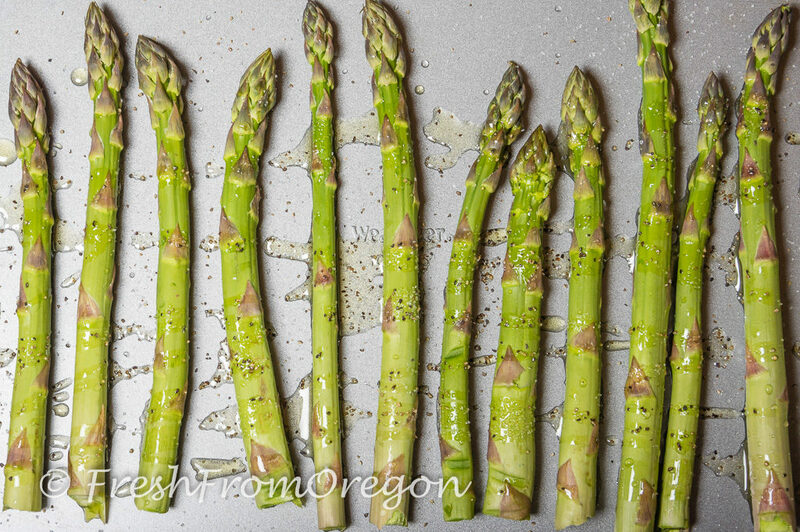 Preparing the asparagus is easy just rinse with water and cut off the tough ends. 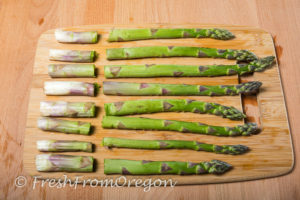 Cut where the white purple ends meet the green part of the asparagus. Preheat oven to 400 degrees. 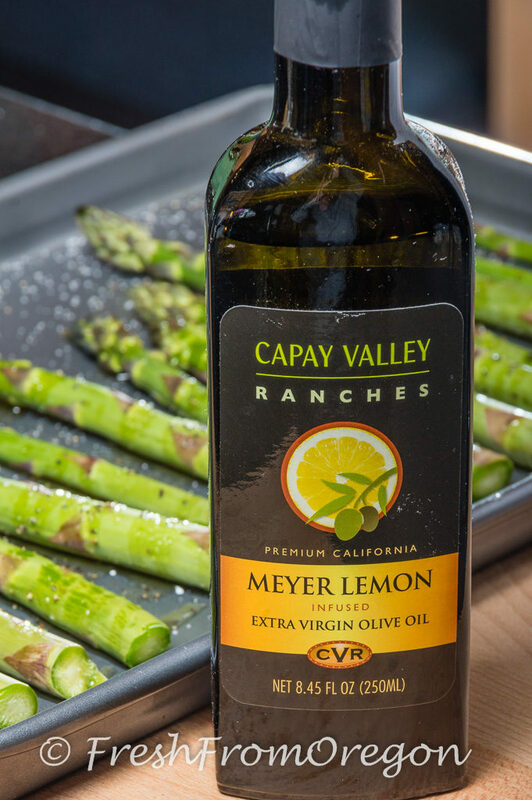 Place asparagus on baking sheet and drizzle with the Capay Valley Lemon Meyer Olive Oil and sprinkle with salt and pepper. 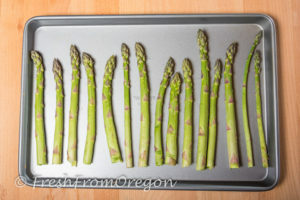 Place in oven to roast, depending on the diameter size of the asparagus stalks I will roast the thinner ones for 5 minutes and the thick ones for 10-12 minutes. 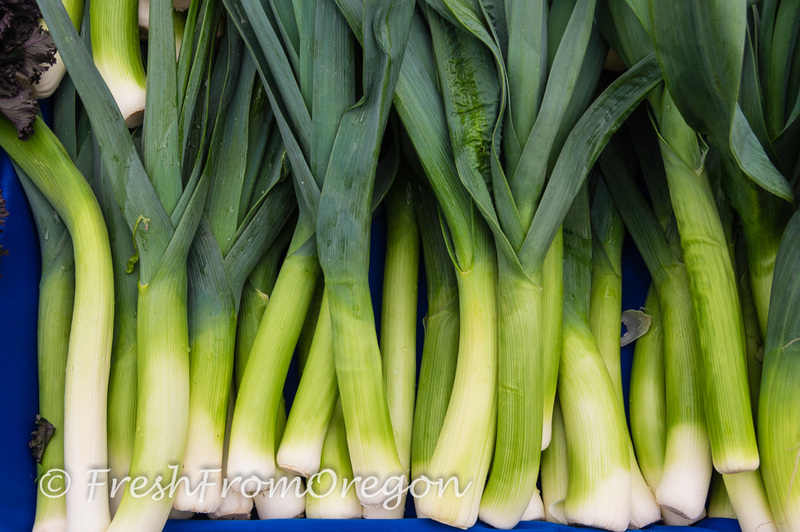 It has been a very rainy spring this year in Oregon, so with a peek of blue skies today I headed to the Beaverton Winter Market. 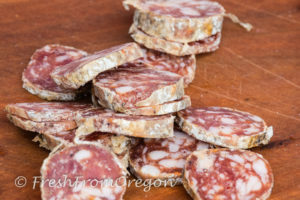 I live in the foothills of Mt Hood and this is a little over an hour drive for me but I just had to see what was Fresh from Oregon at the Market. From blue skies to sprinkles of rain and dark clouds I arrived at the market to a few light rain drops, but hey this is Oregon. During the Winter Market there are about half as many booths as you would find in the summer market but there was plenty of goodies to choose from. 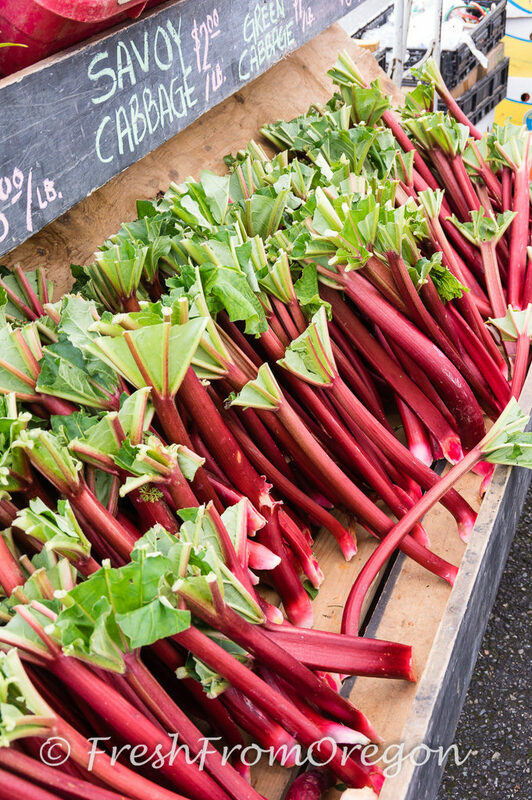 The first booth I stopped in had a huge display of rhubarb, WOW I did not know that you could get fresh rhubarb Fresh from Oregon in April, I wish the strawberries were ready and I could bake a pie. 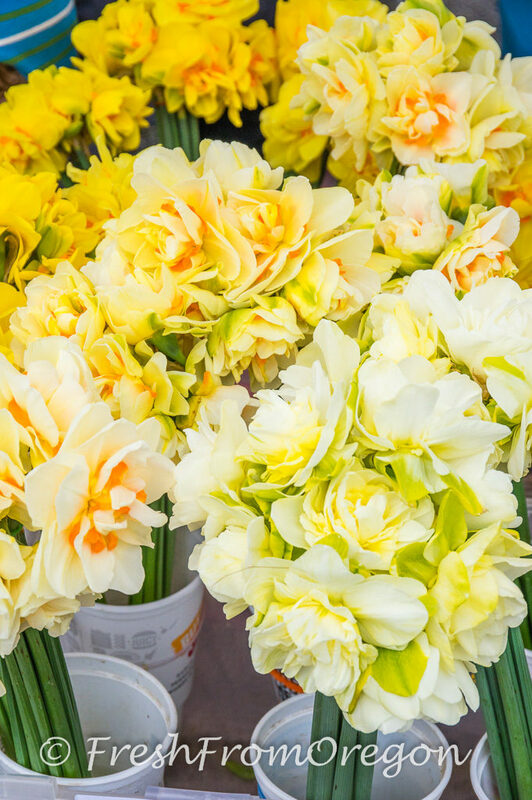 The colorful bouquets of daffodils and tulips made it feel even more like spring. If you are at the market and you want the best selection of apples this time of the year then you have to stop by the Kiyokawa Family Orchard booth. Boxes and boxes overflow with apples picked last fall and they were still nice and firm. 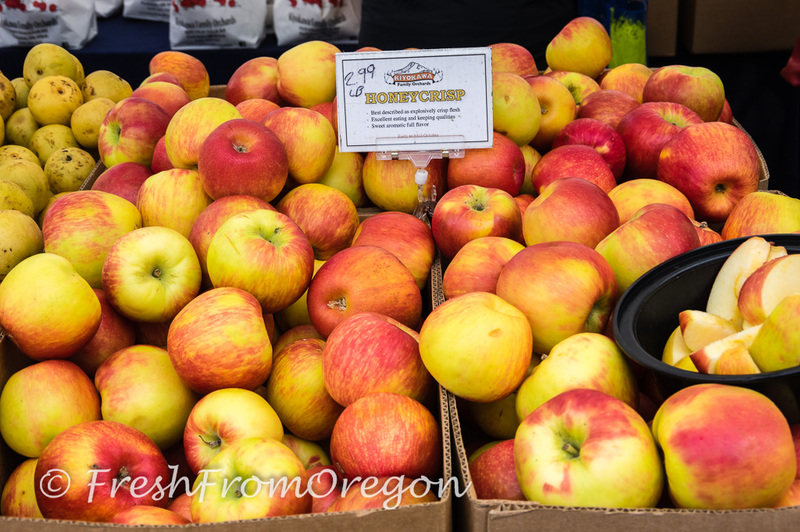 They had at least 15 different varieties and I filled a bag with my two favorite apples, Gala great for eating and Honey Crisp perfect for baking. 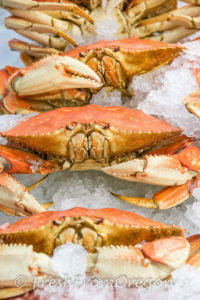 There are several seafood vendors at the market with fresh Dungeness crab, oysters, ling cod, and rockfish just to name a few. Down the aisle I saw a line of people at one of the booths and had to see what everyone was buying. As I got close I could see a nice selection of different fresh mushrooms, dried mushrooms and mushroom powders. The Mushroomery a certified organic family-owned mushroom farm that grows gourmet and medicinal mushrooms was here at the market. After pondering over the different types I bought a basket of Shiitake mushrooms that will be perfect on a white pizza I plan to make for dinner tomorrow. I will have to check out the different mushroom powders they had another time. It is a little early but there were some potted herbs and vegetable starters if you are ready to plant in your garden. 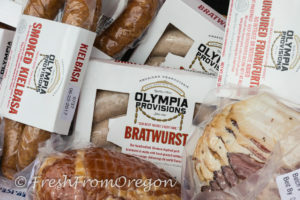 There are many food artisans at the market and I stopped by Olympia Provisions to try a sample. I tried slice of their Salami Nola (NO-lah) which is a coarse-ground Italian salami with black pepper, chili flake & allspice. It had a nice mild taste and with a touch of the spices and just what I was looking for to add to a cheese plate. Olympia Provisions is Oregon’s first USDA-approved salumeria and the art of curing meat the old-fashioned way is what you will find with all their products. 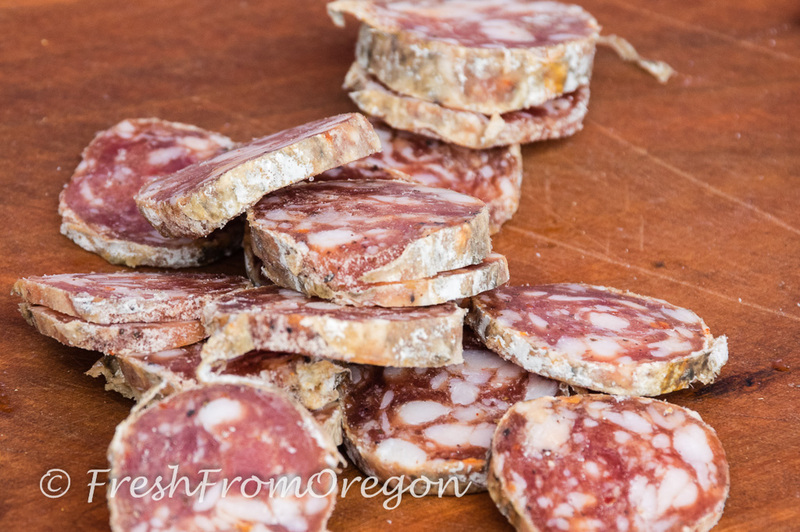 Being made here in Oregon is a bonus for me but they are sold all across the country, check out their website to see where you can enjoy their Old World taste. I was ready for something sweet and as I started down the next aisle the first booth was Nola Doughnuts. There were so many different gourmet doughnuts, an apple fritter and mini bites to choose from. What makes these doughnuts so different than others are the layers. They are handcrafted over a three-day process using a layering technique commonly found in French pastry making. 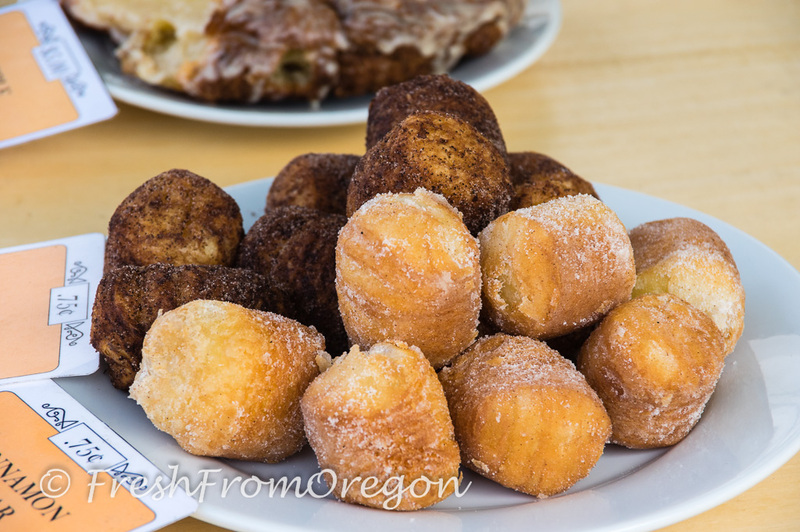 Which flavor to pick Cajun Maple Bacon, Lemon Poppyseed, Raspberry, Chocolate Ganache or maybe the Apple fritter. I decided to stick to may favorite Chocolate Ganache and added a few mini bites also to the bag. 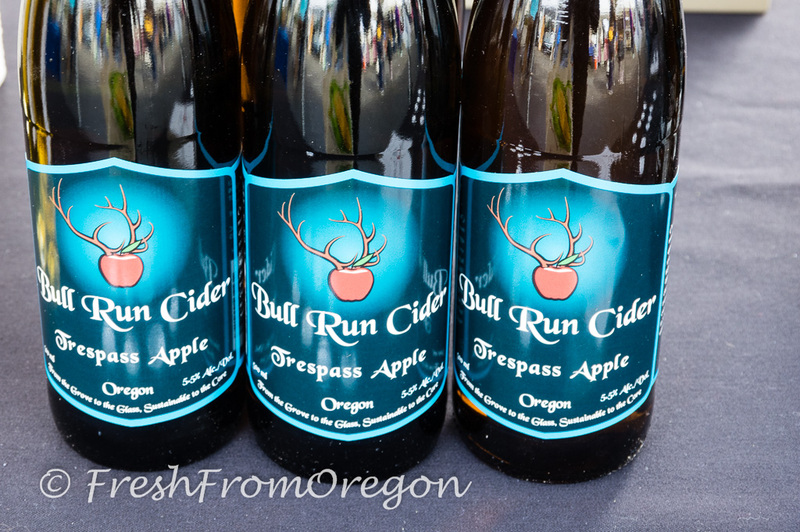 For the past few years the market has been home to many craft hard ciders and spirits and I normally do not stop and try a sample but with a road trip planned next week in the new RV I thought I would find something to take on the road. Bull Run Cider had a nice selection and I stopped to try a few samples. They had three different dry hard ciders but I like mine sweet so I tried the Trespass Apple and it was perfect. 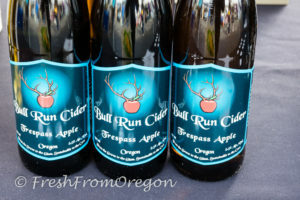 They produce their craft hard cider in the foothills of the Oregon Coast Range and have a tap room open Thursday, Friday and Saturday nights. I have already filled my first bag and have a second to get some fresh produce. The last booth in the aisle I could see the piles of fresh produce. 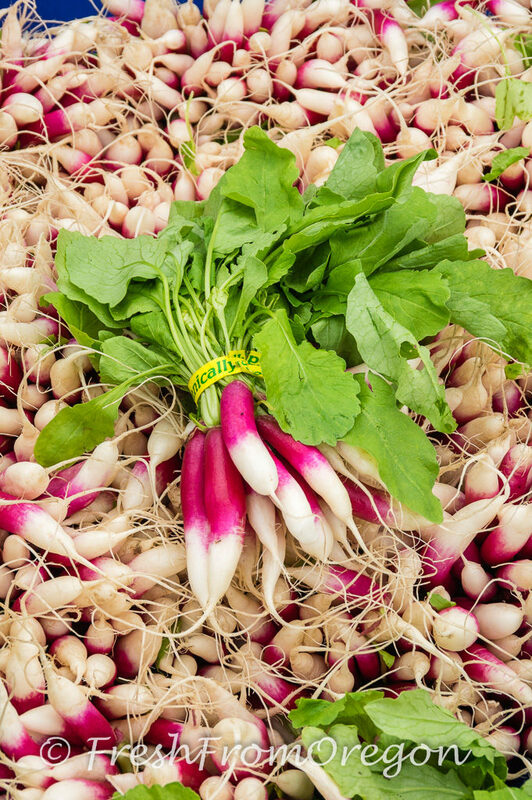 Sweet potatoes, white & purple potatoes, leeks, radishes, greens, onions and more. My bag was filled with a few onions, white potatoes that I can pan roast for dinner, a few sweet potatoes that will make a nice filling in some homemade pasta and a few leeks that will go on my pizza or maybe a nice potato leek soup. 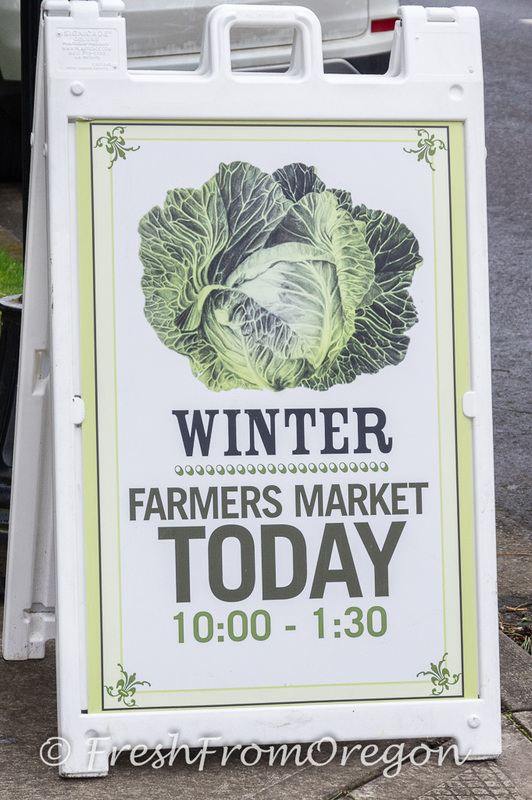 With both my bags filled I headed to the car, glad I made this trip to the Beaverton Winter Market today. Winter Market is only open 10:00-1:30 through April on Saturdays and then the Summer Market opens starting in May and is open 8:00-1:30. 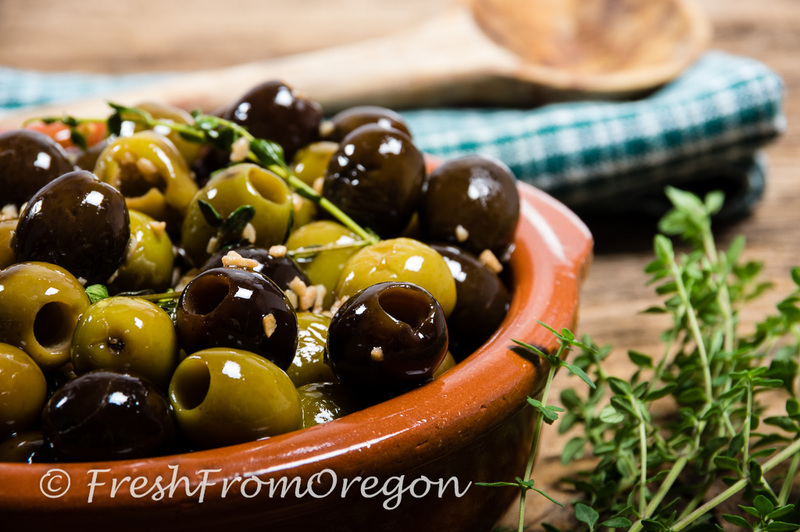 Kalamata, Manzanilla and Queen olives mixed with a robust flavor combination of garlic and basil that is reminiscent of summertime on the Italian seaside. These would be perfect on an Antipasto Platter. 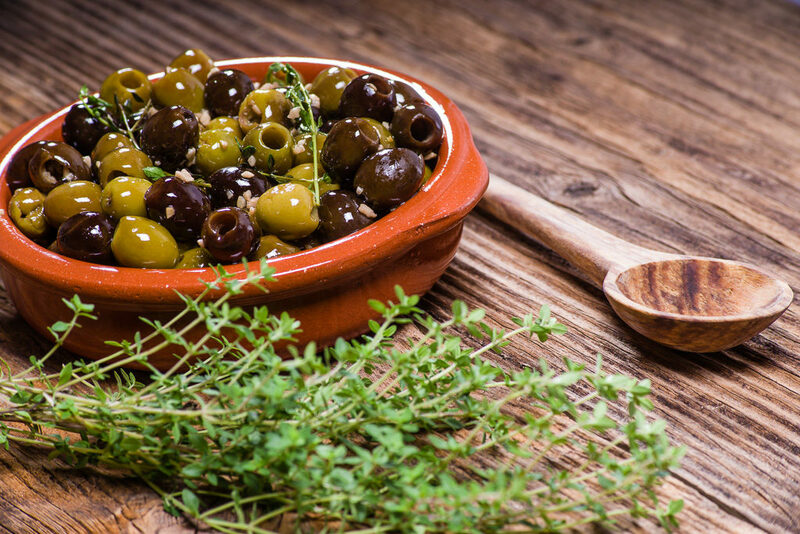 A simple combination of parsley, black pepper and garlic is the ultimate enhancement to a perfect assortment of queen, Kalamata and Manzanilla olives. Toss these olives in a traditional Greek salad to add new layers of flavor. A hearty mix of garlic, paprika, marjoram, cumin and laurel leaves produce a bold and flavorful olive blend. Toss these in a pasta salad or chop some up and add to your favorite frittata recipe. Coming soon NEW Lindsay Party Picks … Entertaining made easy, these olives are already on a pick in the jar, just open and add to your Martini simple and easy. Check out all the flavors they will have: Red Pepper, Spicy Veggies, Garlic, Sweet Veggie, Jalapeno, and hot Piri Piri Peppers. 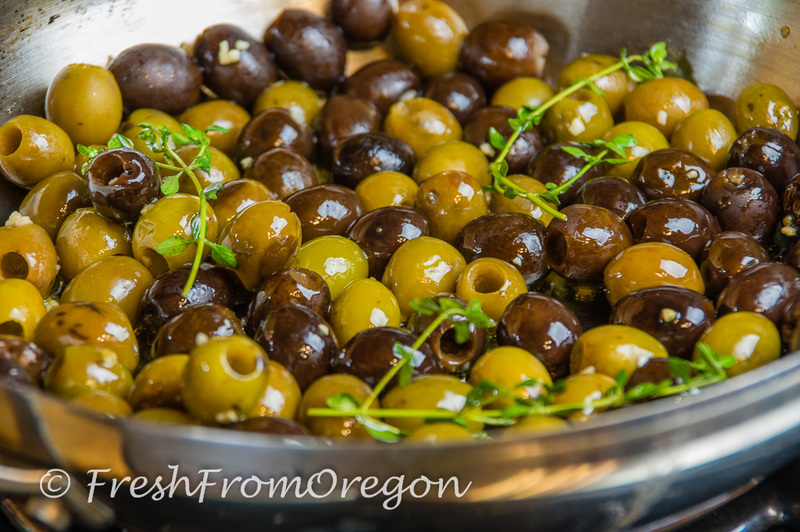 Keep some Lindsay olives on hand just in case you have some family or friends that stop by. Here is a quick and easy recipe you can throw together in minutes. Heat oil in a large skillet over medium heat until hot. Add olives, garlic and thyme sprigs; saute 5 to 6 minutes or until heated through. Remove from heat; stir in vinegar and pepper. Serve warm or at room temperature. With its Mediterranean climate of mild winters and long hot summers Capay Valley is an ideal place to grow the finest olives and nuts. 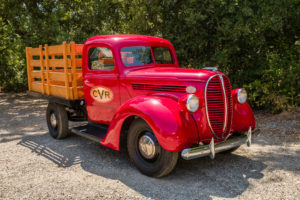 Here you will find Capay Valley Ranches nestled in this beautiful agricultural area just a short drive northwest of downtown Sacramento. 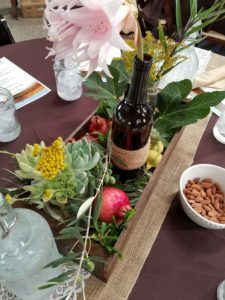 I had the opportunity along with a bus full of other food bloggers during the IFBC to visiting and tour Capay Valley Ranches. We arrived at their Taber Ranch location and were treated to a Farm to Fork lunch all made with their olive oils and balsamic vinegars. 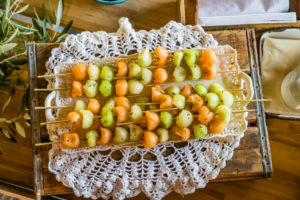 Roasted almonds tossed in CVR Rosemary Olive Oil & fresh herb and fresh melons tossed with fresh mint and CVR Honey were waiting for us as we arrived. Inside their rustic barn set among grape vines, olive trees and almond trees we were served the most amazing lunch. If you are looking for the perfect venue for a wedding, meeting or event you need to check this place out Taber Ranch Event Center. 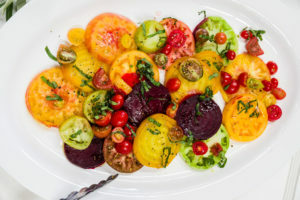 Platters of Heirloom Tomatoes and Roasted Beets drizzled with CVR Arbequina Extra Virgin Olive Oil sprinkled with feta cheese and fresh basil looked like an artist palette. 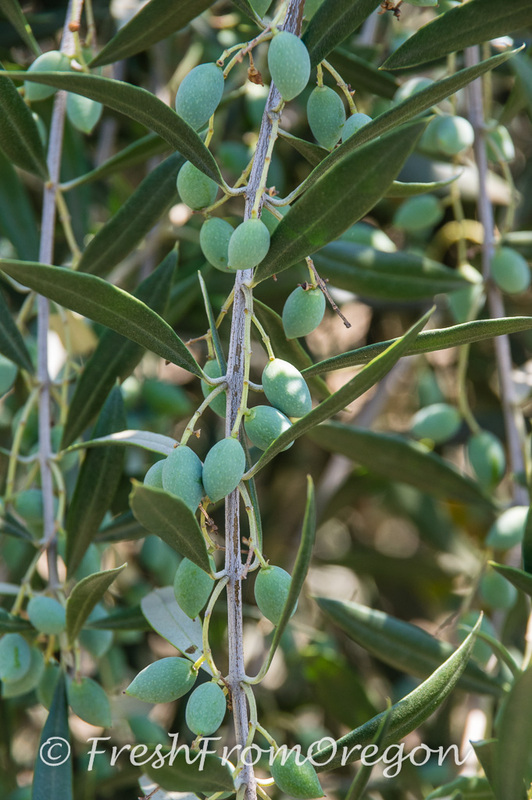 Arbequina olives are a Spanish varietal which makes a medium-bodied olive oil that has a freshly cut grassy flavor with floral undertones. The grilled chicken was basted with a BBQ sauce made with CVR Sriracha Mango infused White Balsamic Vinegar giving it a sweet hot flavor. 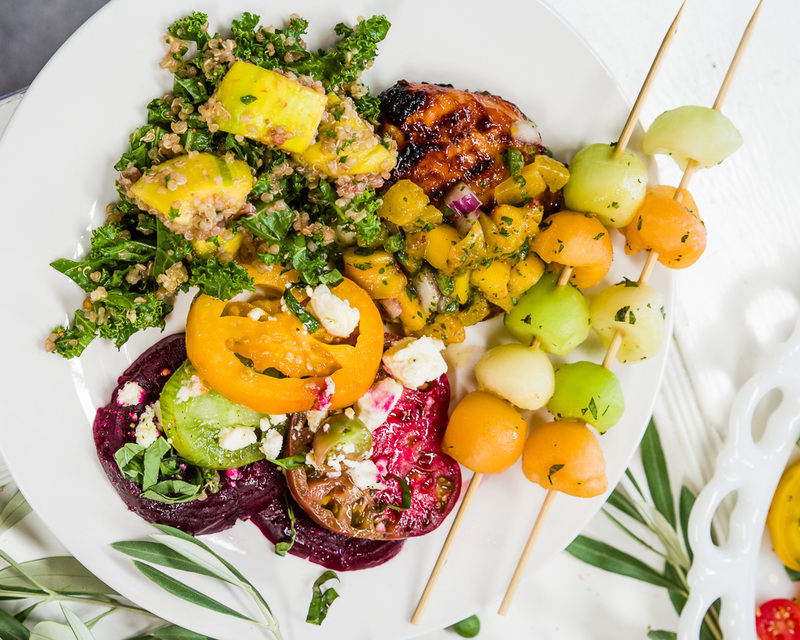 A bowl of Quinoa, Kale & Fig Salad tossed with CVR Meyer Lemon Extra Virgin Olive Oil & balsamic dressing made the plate complete. 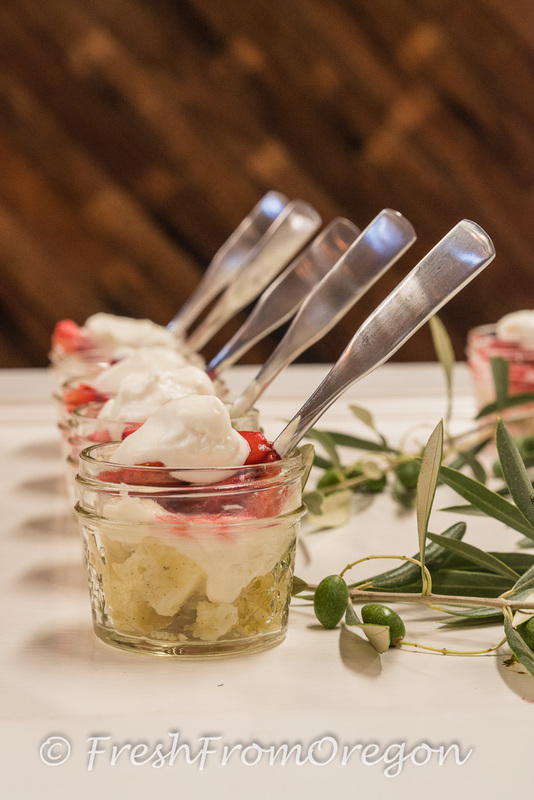 Just when we thought we could not enjoy any more a tray of Cake Parfaits made with CVR Basil Extra Virgin Olive Oil served with roasted strawberries & mascarpone cream was served finishing this amazing meal. 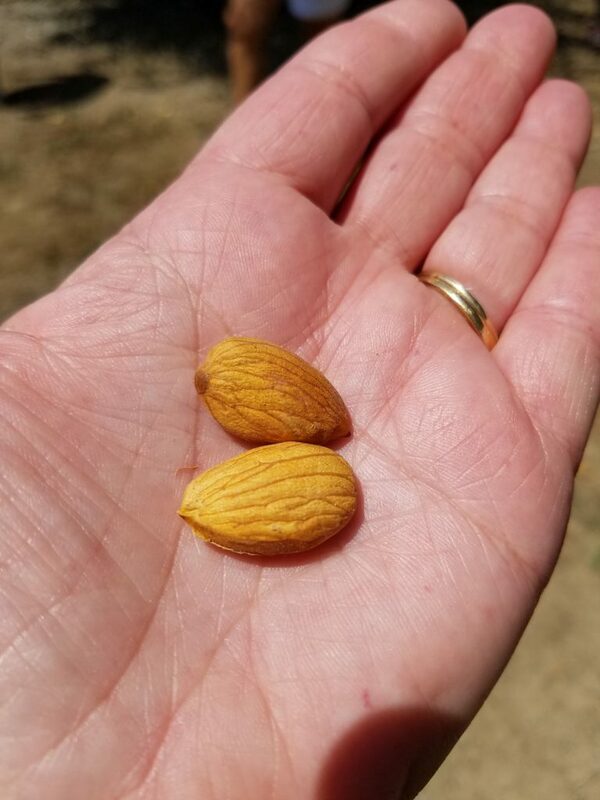 With our guides, owner Chris Steel and farm manager Joe Armstrong we toured the olive trees and almonds trees learning all about how they grow and are harvested. We were able to get off the bus and walk among the olive trees which were filled with hundreds of tiny olives that will be harvested in the fall. 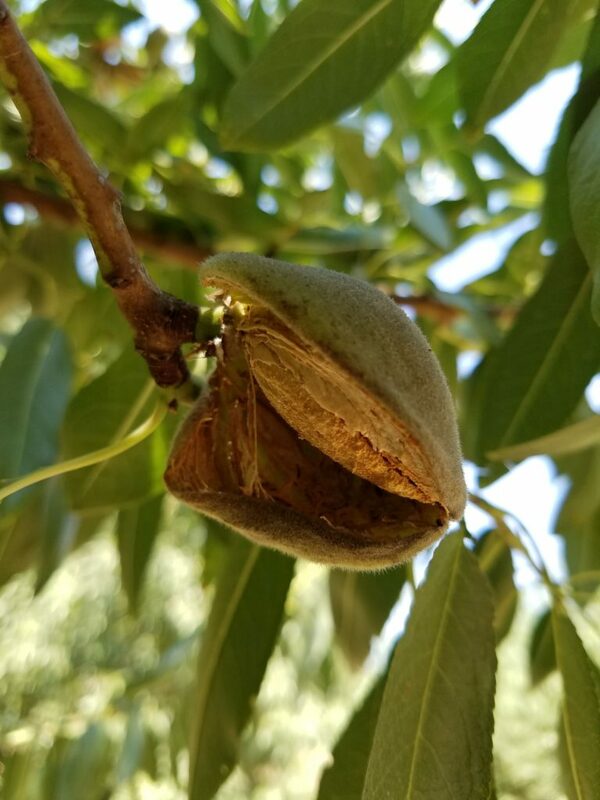 The almond trees, pronounced Amonds with out the “l” were starting to crack through their outer shell and within a few weeks they should be ready to harvest. 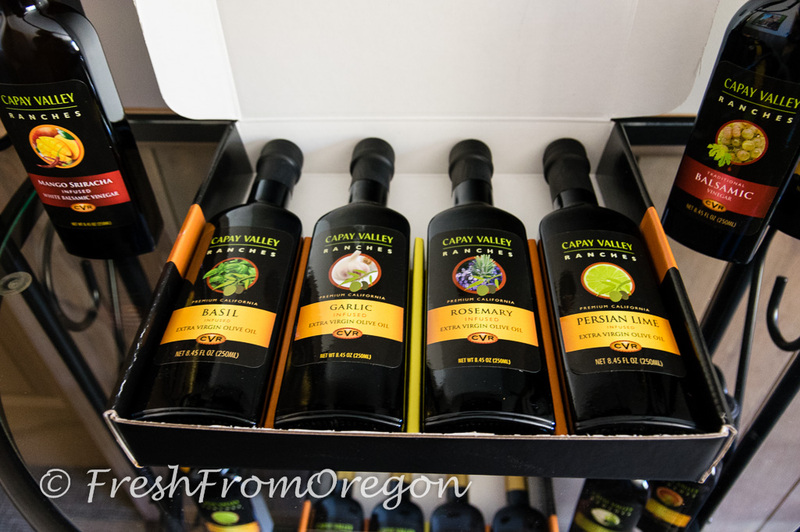 We were each able to chose an olive oil to take home with us to try. I picked a bottle of their Rosemary Olive Oil and plan to make a Rosemary Focaccia with fresh cherry tomatoes. My husband, my official photographer, picked the Blood Orange infused Olive oil which is excellent for baking, adding a hint of orange flavor to sugar cookies, pound cake and delicious in brownies. It will also make a great vinaigrette to drizzle over a salad or tossed with pasta. Remember Olive Oil is its freshest when used within 18 months after it is harvested and milled so buy local USA made olive oil. 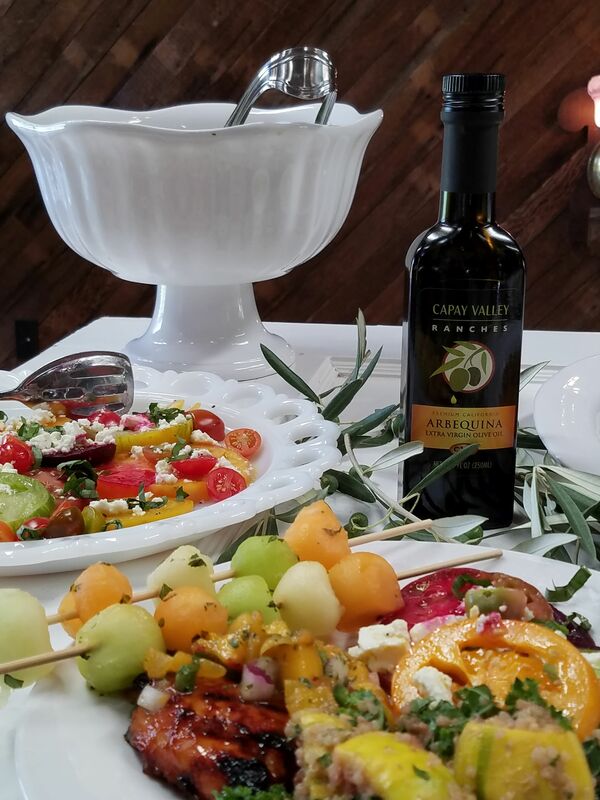 Explore and cook with some of these flavored olive oils from Capay Valley Ranches. Preheat oven to 350 degrees. 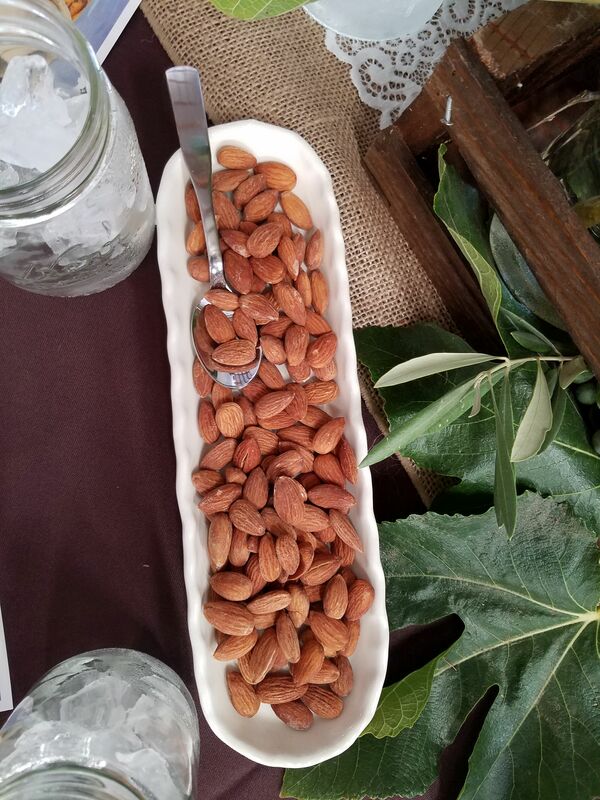 Spread the California almonds in a single layer on a rimmed baking sheet, and toast in oven until golden, about 15 minutes, shake pan every 5 minutes to keep the almonds evenly toasted. Let the almonds cool completely, then transfer to a small bowl. Add CVR Rosemary Olive Oil and salt, and toss until almonds are well coated. 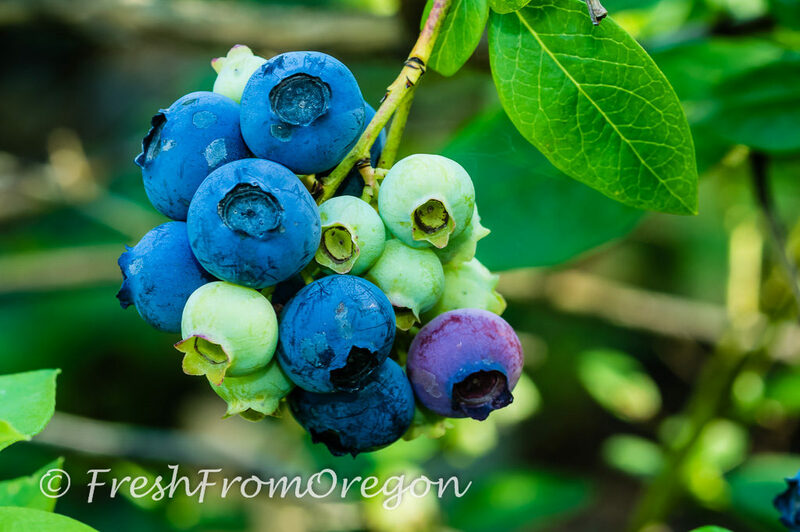 Fresh from Oregon, blueberries have a long season and you can still find plenty at the local farmers markets and stores. Here on the mountain (Mt Hood) I have been picking the blueberries from my bushes for about a week. With the higher elevation we are about 4 weeks later than the farms in Portland, Oregon. With Blueberry Muffins on the menu for breakfast today I was out early in the morning to pick 2 cups of fresh blueberries. 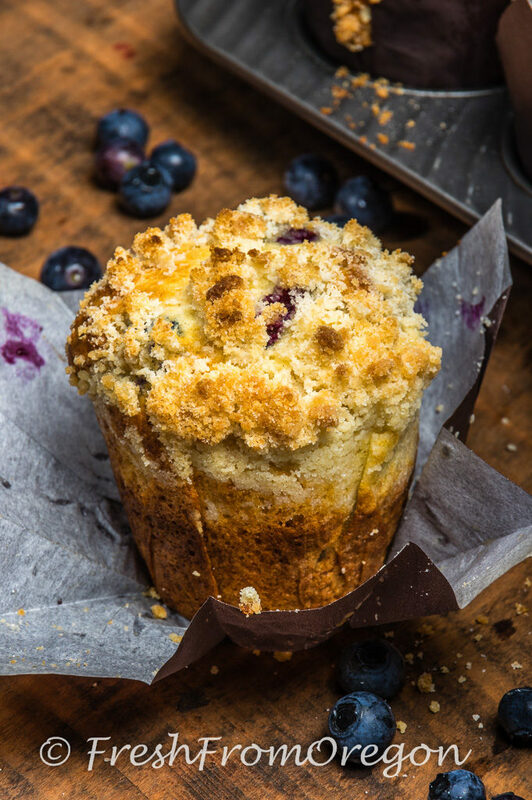 The recipe below will make a nice tall muffin if using tall paper muffin cups in your muffin tins or if you want a more shorter muffin with a large top bake directly in the muffin tin. To me a muffin is best with a little crumb topping but if you prefer you can just leave plain or sprinkle with some coarse sugar. Heat the oven to 375 degrees and coat a standard 12-cup muffin pan with non-stick spray or place tall muffin paper cups in muffin pan. Whisk together the flour, baking powder, baking soda, and salt in a large mixing bowl. In second bowl whisk together the sugar, oil, eggs, yolks, yogurt and orange zest until smooth. Make a crater in the middle of the dry ingredients and pour the wet ingredients into it. Stir with a rubber spatula until just barely combined. Resist the urge to over-mix – there should be a some lumps of flour in the batter. Fold in the blueberries, mixing just to combine. Drop about a cup of batter in each of the muffin tin’s wells or paper cup. You may have extra batter to make a few more muffins. The cups should be quite full. 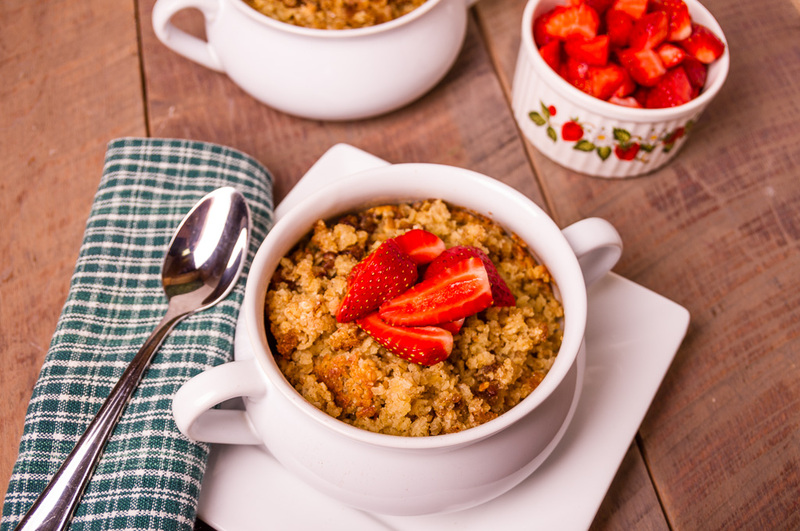 Sprinkle the muffins with crumb topping and bake for 25 to 30 minutes, or until a toothpick inserted into the bottom of a muffin comes out clean. Remove from oven and turn out onto a wire rack to cool. Serve immediately or store in an airtight container for up to a week.